Be a body builder or an extremely thin person, energy drinks are becoming very popular for gaining weight and building muscles. They are basically beverages that contain legal stimulants that are approved by the drug authorities. Some of the main ingredients of healthy energy drinks are caffeine, sugar, ephedrine, taurine, guarana, ginseng, etc. Their content in a health drink differs from one brand to the other. In this article, we have provided information on the types and effects of energy drinks. Energy drinks can be classified on the basis of the ingredients on which they are based. 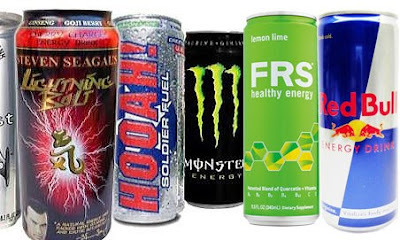 Check out the main types of energy drinks found in the market today. * Caffeine-based: Caffeine is the ingredient found in most of the energy drinks as it acts as a stimulant for people. Usually, the amount of caffeine in an energy drink is somewhere between 100-200 mg. Some of the caffeine-based drinks are Redbull, Monster, and Rockstar. * Taurine-based: Taurine is the active ingredient in the product called OHM, which is majorly used in energy drinks. The best part of Taurine is that it not only maintains the energy level in the body, but also helps the body cope up with stress. * Guarana-based: Guarana is an ingredient found in plants that grow in South America. It mainly helps in increasing the level of awareness as well as the energy levels of the body. It can be compared, to quite an extent, with caffeine. * Vitamin B-based: Considered to be amongst the best energy drinks in the market, the ones based on Vitamin Bs are believed to help in kick-starting the body into action. * Ginseng-based: Ginseng is the name of an herb that is now-a-days being used as a major ingredient in energy drinks. The potential benefits of Ginseng are increase in energy levels and alleviation of stress. * Ginkgo Biloba-based: Ginkgo Biloba is another popular herb that is receiving interest from health drink makers. There are a number of benefits according from it, namely improvement of memory, concentration levels and blood circulation, along with regulation of stress levels. * L-Carnitine-based: L-Carnitine is a nutrient produced naturally by the human body. It mainly helps in speeding up the metabolism, improving the energy levels and enhancing the endurance of the body. When used in energy drinks, it accords the same benefits. * Sugar-based: A number of energy drinks in the market today have been made using sugar as the main ingredient. Such health drinks provide a lot of energy to the body. * Antioxidants-based: Antioxidants are being used for making many energy drinks these days. They not only help the body in killing the free radicals, but also speed up the recovery process of the body after any damage through illness or otherwise. * Never ever substitute energy drinks for water. This is because the diuretic quality of the caffeine in the health drink can result in a dehydrating effect on the body. * A single energy drink is not suitable for each and every activity. Depending on the activity that you are going to undertake, select the best possible drink. * Never ever combine energy drinks with alcohol. This is because health drinks are stimulants, while alcohol is a depressant. The combination of the two can only result in disaster for your body. I've never seen a few of these drinks before! I'll have to look into it! Speaking of looking into energy drinks, have you tried 6 Hour Power? That's my favorite! I love it because there's no crash. Also, no calories, no sugar! Since you're into energy drinks, I work for Stacker 2 and there's a survey right now at http://www.surveymonkey.com/6hrpowersurvey and I'd really appreciate it if you wouldn't mind taking it! Thanks and I hope it's okay that I commented on your blog! If you have any questions, email me! Obtaining energy is the main purpose of taking energy drink.Caffeine and sugar are the main ingredients of energy drink.It helps to stimulate central nervous system and enabling physical and mental alertness.But it also have side effects like irritability and high blood pressure..so,we need to drink energy drink in moderation..Very informative blog.It helps to understand different types of energy drink and it's side effects on human body. Great info! Thanks for sharing. I would like to share this article from energy natural hydration drink about energy drink. Whether it’s beforehand a long day at the office, a hard trial, or an all-night study meeting, many of us go to energy drinks when we need a little boost. Best healthy energy drinks mexico are a multi-billion buck manufacturing. If their admiration is any sign of their efficiency, they seem to be working.